The hunger for laughs in this tiring production is that desperate. And the occasion for laughs is that rare. Young Frankenstein may be the funniest of Brooks’ string of movie comedies, and it certainly had the most inspired casting. 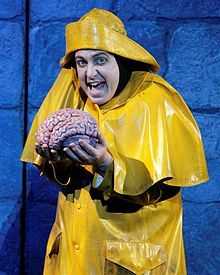 But the octogenarian funnyman, apparently soaring with his success onstage with The Producers, pulled no new tricks out of his hat for Young Frankenstein. The stage show feels like a retread, with pale imitations of the movie’s actors parroting lines that were a whole lot funnier in 1974. And director-choreographer Susan Stroman, whose work brought sparkle to such different Broadway fare as The Producers, The Music Man, Contact and Crazy for You, seems to have been off her game in Young Frankenstein, where the staging only very rarely shines. All of that was true, also, when Young Frankenstein opened on Broadway in 2007, where it ran for a little more than a year. (Compare that to six years for The Producers.) 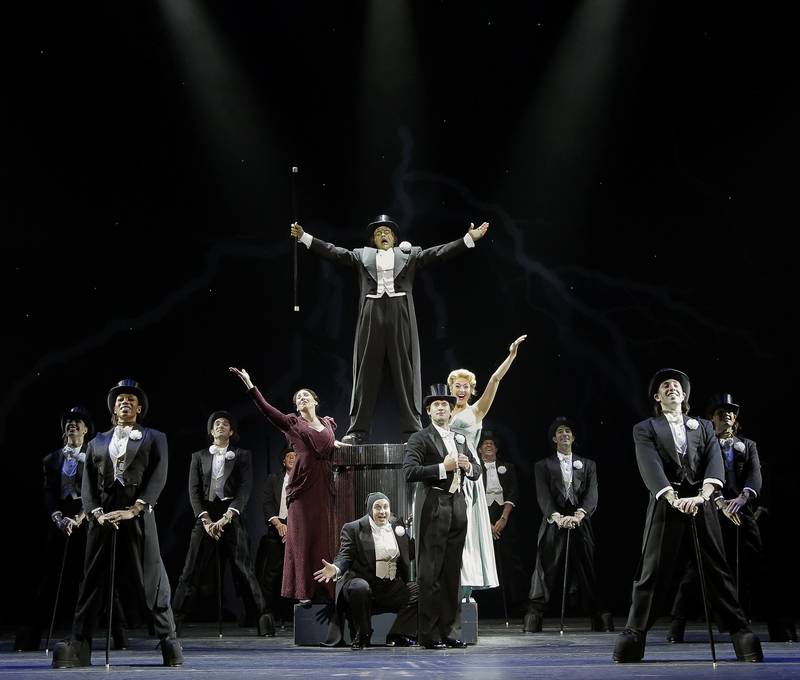 And it’s even truer for the bland touring production, where a hard-working cast never rises above the disappointing level of their script and songs. The actors who get the best material ride with it; those who don’t, suffer. So, while Cory English (Igor) and Joanna Glushak (Frau Blucher) can make something of their eccentric characters, some of the other actors are not so lucky. Christopher Ryan (who looks like Dickie Smothers with a coif) finds none of Gene Wilder’s looniness in Frederick Frankenstein, and Synthia Link is a humdrum Inga. Janine Divita isn’t interesting enough as the strident Elizabeth to warrant the star treatment she receives. But Preston Truman Boyd does make a sweet-tempered monster, and David Benoit, as a jolly blind hermit, proves to have a terrific voice. Still, most of Brooks’ songs are a snooze, or else he has taken the movie’s funniest jokes (“He vas my boyfriend”) and, by turning them into songs, has beaten them into submission. It doesn’t help that the opening-night sound was so muddy that it was nearly impossible to understand the lyrics. And it doesn’t help that Irving Berlin’s “Puttin’ on the Ritz” is still the best thing about Young Frankenstein, even though Stroman beats that one to death too. When I leave a new musical humming the tune from a song written in 1929, I’m inclined to think something that’s anathema to me – that maybe it really is better to skip the theater, stay home and watch the old movie on TV. What: Touring production of Mel Brooks-Thomas Meehan musical. When: 8 p.m. Nov. 30-Dec. 3, 2 and 8 p.m. Dec. 4, 1 and 6:30 p.m. Dec. 5. Running time: Two hours and 35 minutes, with intermission. Photos: Top right, Preston Truman Boyd and Christopher Ryan. Middle right: Synthia Link, Christopher Ryan and Cory English. Middle left: Cory English, Joanna Glushak, Preston Truman Boyd, Synthia Link, Christopher Ryan and the company. Lower right, Cory English. Lower left, Preston Truman Boyd and Christopher Ryan. This entry was posted in Broadway, Reviews, Tours, Uncategorized and tagged Cory English, Mel Brooks, Susan Stroman, Young Frankenstein. Bookmark the permalink. I wholeheartedly agree with your review. When I saw it on Broadway, I was very disappointed, perhaps with an elevated sense because I am such a fan of the movie. Even the easy joke about the large metal items on the entrance to the castle fell completely flat on stage. I am a fan of Mel Brooks movies; I find, however, that I am indifferent about his stage productions – I didn’t particularly like “The Producers”. I thought the set was fantastic. How they travel with all of it must be one tremendous task. I thought that some of the dancers must have been in FIDDLER; same style. I did enjoy the show, and left laughing and satisfied. Maybe I was sitting too far away(Orchestra Left, Row Q) to see the expressions on the face of the actors, or maybe I didn’t really appreciate the movie (I was 4 when it came out), but I absolutely loved last night’s show. I thought the songs were catchy, raucous, and just cheesy enough to make them hilarious. The set was full of depth and color, although I could have done without the strobe lights in the face, and from where I was sitting, the sound was fine. I think that people less familiar with Brooks’ movies might enjoy this show, especially if they come to it without any expectations on how they think it should be. If you’re a fan of the movie, and you’re expecting the stage show to be just like it, then you’re going to be disappointed. On it’s own, I thought it was a fine show and worth seeing. 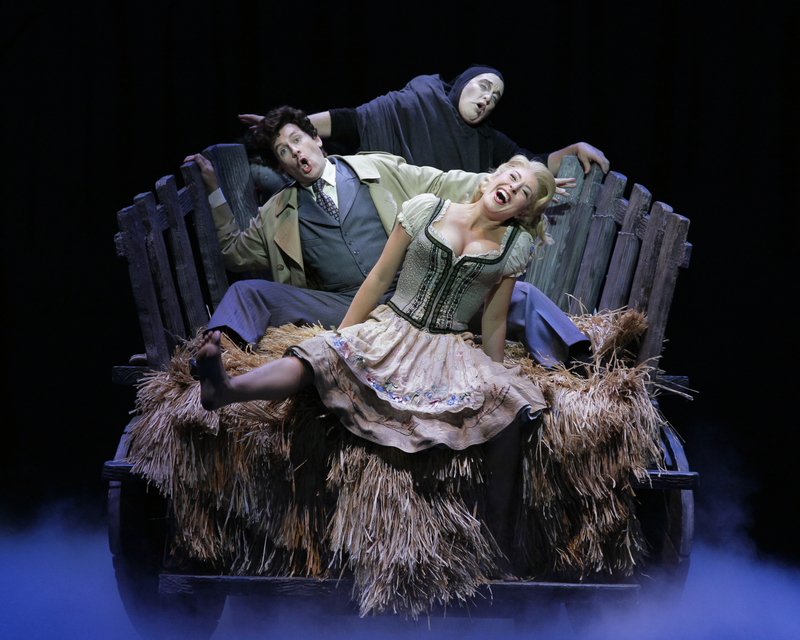 That review sure makes me want to see “Young Frankenstein”….NOT! Your review is so off! We LoVED the show! It was excellent humor in typical MelBrooks style. 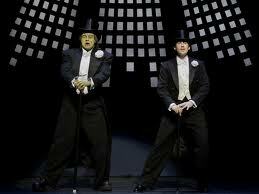 They’re musical fleshed out the film version of Young Frankenstein nicely. This type of review annoys me. Hard working, talented cast and crew depend on ticket sales. A review like this unfairly assaults the artistic endeavor of so many, when the reviewer seems to just not “get it”. Our community is so fortunate to have the opportunity to see Broadway touring shows and I hate to think that an inaccurate review like this can affect the success of such shows. Go see it. The cast, sets, music and dance were top notch! You can tell by the audience reaction how much this show delivers!